I can’t believe it’s been over a month since my last post! The last anyone had heard from me, I had started training for a fitness competition. Stepping on stage has been a dream of mine for over a decade. I mean, who doesn’t dream about stepping on stage wearing nothing but a bikini and a set of clear, high heels? Anyone? Anyone?? Surely, the girl who ran off stage during her ballet recital when she couldn’t find her family in the audience, at the tender age of 6, would want to do it all over again, except this time half-naked. It totally makes sense for the girl who hates standing in front of a room fully clothed to gallivant on stage for the entire world audience to see any imperfection, right? Well, for whatever reason, I’ve had the itch to compete in a show for years. I thought the time was finally right for me. I found a great coach and started training. I was seeing noticeable improvements from week to week, sometimes even daily. I ate my planned and pre-packed meals in the middle of car rides with my boyfriend and special events with family. I was waking up ridiculously early, even on weekends, to fit in all of my training. This is what you must do if you want to compete. If it’s truly your dream you’ll make it happen, I kept telling myself. In this same span of time work was becoming absolutely nutzo. By the end of my very long days I was extremely irritable. Poor Rob was walking on egg shells, especially when I almost ripped his head off one night when I couldn’t find my precious rice cakes. RICE CAKES! Not even the yummy flavored ones; rather the plain, tasteless ones, because they have less carbs. If you knew me you’d know how so completely out of my nature it is for me to speak louder than barely more than a whisper. Between being abused (not physically) at work and the demands of training I was turning into someone I really didn’t like. I became highly stressed and with stress I fall back to old habits. We all know what this bad habit of mine is, right? My eating disorder (we’ll call it ED), which I’ve been battling since college. I thought I had gotten past it, but ED quickly reared his ugly head when all of the stress overwhelmed me. I then began swimming in a sea of depression and shame, along with the stress that had overtaken my life. Rob came home to me one night just sitting in bed, staring at a blank tv screen with tears streaming down my cheeks. Something had to change! So, after weeks of this depression and many tears being shed silently, a random text of love from my mother and then a call to her the next day became a turning point for me. Mothers are good like that, aren’t they? Somehow, they can make just about anything better. I let my struggles all out to her, as I sat in my car, parked outside of the gym. The night before I had pulled all of my old nutrition, diet and cookbooks out from the attic and sat utterly confused with them surrounding me. I didn’t know how to break the cycle. What made me panic even more is my sister’s upcoming wedding. It wasn’t only having to fit into the maid of honor dress, but also the fact that I didn’t want to be Debbie Downer at every special moment along the way for her. After the talk with my mom, I wiped the tears from my face with a new sense of confidence in myself. I walked into the gym to work out, but not to do the workout that I had originally planned for myself. This time I was walking into the gym to work out for good health, not to hit 15% body fat or to wear a bikini on stage. Life is so much more than the hours you put into the gym or eating perfectly clean every day! I had burrowed so deep into all of the negatives that I forgot about all of the positive things in my life. I even forgot the reason I started to blog and what my blog really meant to me. We all know I’m a perfectionist. When I’m not “perfect” at something I see myself as a failure. I don’t look at others in that same light. To my friends, family and even strangers I am very forgiving. I am my very own worst critic. For almost a lifetime I allowed the need to be perfect to dictate how I lived my life. For as long as I can remember, my weight had been a focal point for me. I thought that if I could just get that part of my life right everything else would fall into place. I would be happy. We all know that isn’t the case though, right? When did just living a healthy life become not good enough, in my eyes? Why go to extremes that are unmanageable and only cause unnecessary stress? I don’t know why, when or how I got to the point that I did. Maybe it was wanting to give the royal “F-You! Look what became of me!” to the bullies that tormented me throughout my school years. Do they even matter now? Will it change the torture they put me through? The answer to both questions is obviously “NO”. Is it trying to prove something to the father who never made me feel good enough growing up? The same father who left our family and my mom holding the bag to take care of their five children? Possibly. Somehow, he’d find a way to diminish the accomplishment, even if I won the entire competition. That’s just how he rolls. I started my blog because I knew there were others out there going through the same issues as myself. I wanted to take a step back, look at my life and all of the good things that fill it and not focus on trying to be “perfect”. I mean, what is perfect anyway? Even when you see someone who looks completely put together, you never know what issues they might be facing beneath their smile. 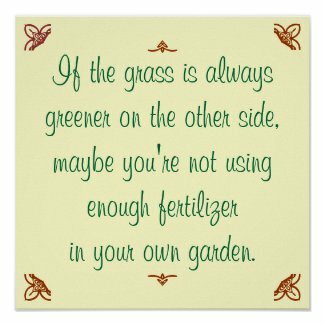 The grass isn’t always greener on the other side. I wanted to fulfill all areas of my life and start truly living because I spent way too many years sidelined by ED. It’s taken me a long time, my friends, but I see that balance, not perfection, is where it is at. If you strive to eat healthy most of the time, get a few good sweat sessions in to get the ol’ ticker working, and lift some iron you’ll be able to fully enjoy the treats you allow yourself some of the time. Most importantly, this should only be a small part of your focus in life. Family, friends, love, laughter and new experiences are really what life is all about. Perfection doesn’t equal happiness. Many times striving for it leads to more frustration and demise than anything else. 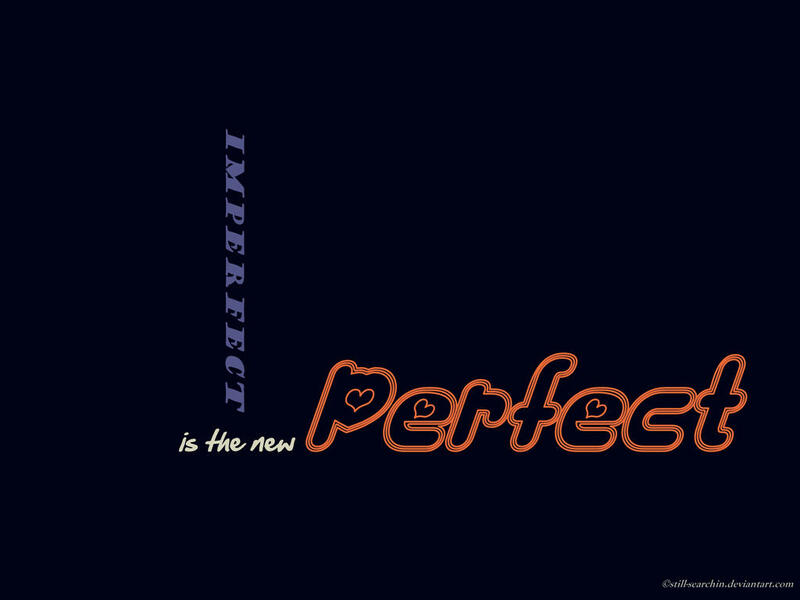 Try living life imperfectly and you’ll find that it is absolutely perfect as is. I’m so glad that I am back on track and remember what’s truly important. This entry was posted in Uncategorized and tagged 2012, ED, Reflective by Kim @ Imperfectly Perfect. Bookmark the permalink. Well written Kim! Many people overlook the things that add up to becoming something great in their lives for “the idea” of greatness. Many people ask me, ” What on earth is there for me to be happy about,” and I reply, “You’re on earth aren’t you? Be grateful for that, because there are many that don’t make it through the night. What is there for you to be happy about? Just take a moment to truly look at the world around you, then ask yourself that question. Something tells me you don’t need my help with that one.” Thank you for sharing apart of your life with the world as we can all do well to learn from each other. I’m still reading it from time to time :d to my shame……..I even wrote once to you telling you how simillar my story is…. I really feel like “jessie j’s ” lyrics “the more i try the less is working”…….